Featuring a 20k Snow bike race on trail only available to snowbikes during the Wildside events. Race course starts and finishes at the Forestville Trailhead. HELMETS REQUIRED. Day of registration will be available at the Forestville trailhead however it is not recommended (cash payment only). Race packets contain many extras including bib, sponsor goodies, and coupons. All snowbikers will need to sign a waiver at packet pick up. Packet pick up will be at the Dome during the Friday night Expo or email registration@noquemanon.com for a Sunday morning bag pick up at the start line. 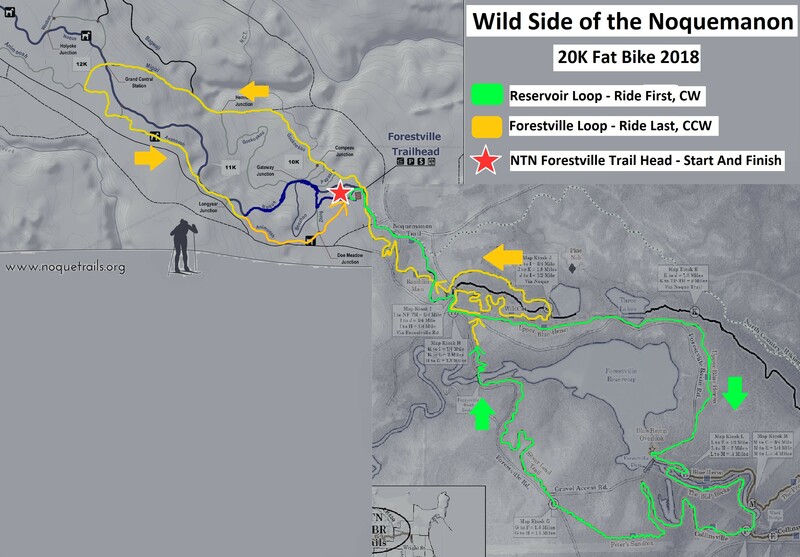 The 2020 Wild Side of the Noquemanon Fat Bike Race will start and finish at the NTN Forestville trailhead. Racers will ride a loop from Forestville through a selection of the NTN North Trails singletrack and back to Forestville, followed by a loop around a selection of the Forestville area ski trails, ending with a pleasant descent to the finish stadium at Forestville. The course will consist of roughly 30% singletrack, 70% cross country ski trails, and will come to just under 21K. Additionally: Start at 1030 feet elevation. Descend to 690 feet to enjoy a section of the best singletrack in town, then settle in for a long but mellow climb to 1190 feet. Enjoy a section of singletrack unique to this event followed by a relaxed ski trail descent to the stadium finish at 1030 feet. 12:30 pm (or whenever racers finish) Awards with custom cowbells will be held at the finish line. Aid Station for the 20k race will be at Forestville. Due to ski race prep no snow bikes are allowed on the course except for scheduled races. A bike specially designed with tires that are 3.5 inches wide or wider to float on snow or soft sand. All riders are strongly encouraged to reduce air pressure. If you ride in an area with little snowfall and rock-hard groomed trails, your “high pressure” habits (7-10 psi) are NOT the right tool for the job here. You will encounter soft, deep snow the likes of which you may have never seen, and a properly aired-down tire (3-6 psi) will float and grip, while a 7-10 psi tire will definitely sink and spin. Currently, NTN is unable to completely separate snow bikes, skiers, snowshoes, dogs, and skijor trail users therefore we ask you to respectfully share portions of the trails. Please honor the trail use designations as our signage indicates. By following these guidelines and trail etiquette, we’ll keep users safe and smiling while enjoying the trails. Thanks!